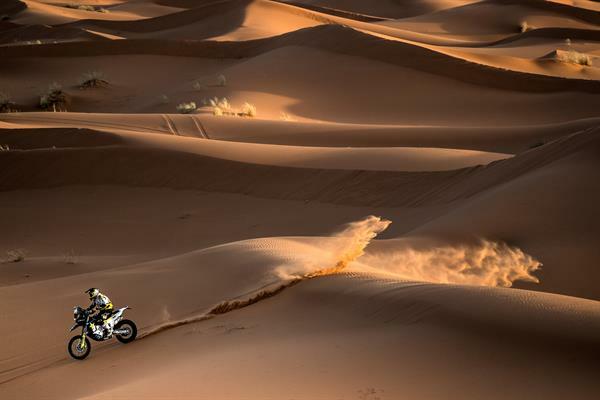 Battling against the heat and the massive Moroccan dunes for a third consecutive day, Rockstar Energy Husqvarna Factory Racing’s Pablo Quintanilla has secured a solid runner-up result on the first part of the two-day-long Marathon Stage. Continuing to improve his speed and navigational skills, Andrew Short brought his FR 450 Rally machine home in 12th position. For reigning Cross-Country Rallies World Champion Quintanilla, it was another positive day in the dunes of Morocco. Among the first riders to take the start of today’s timed special, Pablo used his experience to post the second fastest time for the day. Remaining third in the rally’s provisional overall standings, Pablo has reduced the gap to the rider in second to a tiny margin of one minute and one second. Following Tuesday’s tough stage, motocross legend Andrew Short attacked today’s timed special with the goal to continue learning the ropes of rally racing. Earning 12th for the day, the American now has his eyes set on securing a top 10 spot in the rally’s final overall standings. Reaching the end of today’s stage without any problems, the two Rockstar Energy Husqvarna Factory Racing riders will have to prepare their machines for tomorrow’s stage without any external assistance. Tomorrow’s stage four of the Merzouga Rally will be the second and final part of the two-day-long Marathon stage. Featuring a 233km long timed special in a total of 372km to be ridden during the day, it will reunite competitors with their assistance crews at the Tombouctou Hotel.